It often begins this way. There’s a handshake or signature of non disclosure. Secrecy is sworn. A whisper room or secluded space awaits. At BSC Expo two weeks ago, the setting felt like a spy story, private truffle transaction, or rare art viewing. 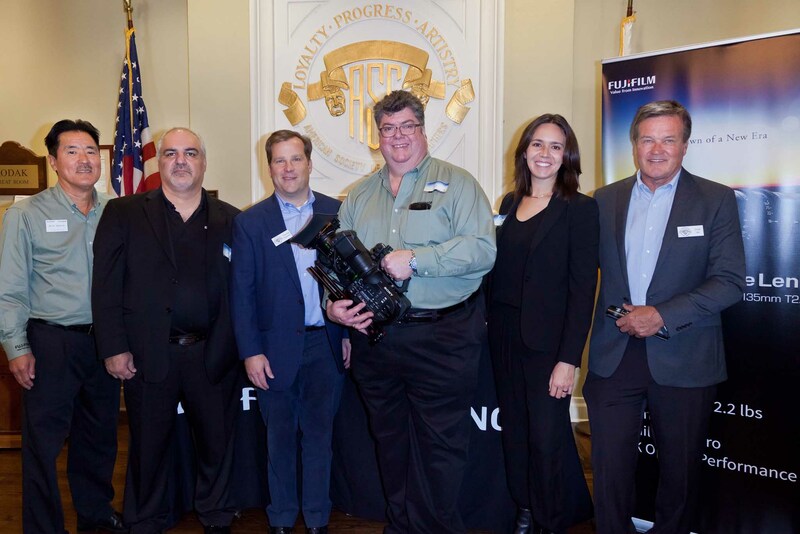 In a hitherto undisclosed secure location (the equipment closet of their exhibition booth), FUJIFILM executives took the wraps off an exciting new zoom lens that had previously been hinted in hushed tones at earlier meetings. 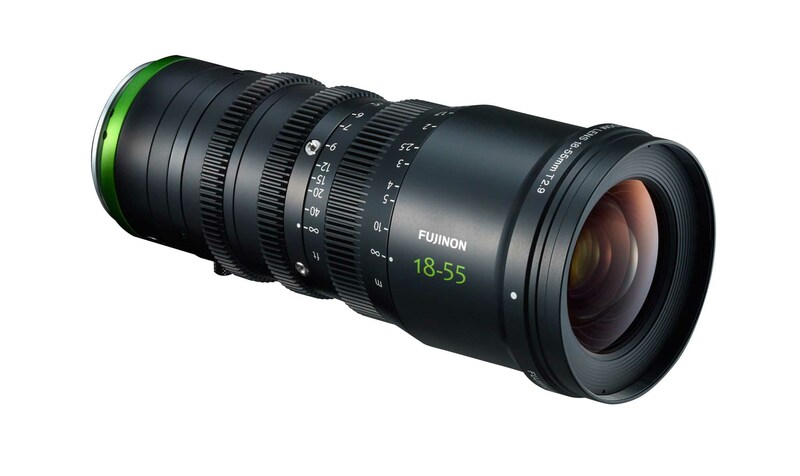 The new FUJINON MK 18-55 T2.9 Cine Lens was officially presented on Wednesday, February 22 in Hollywood. 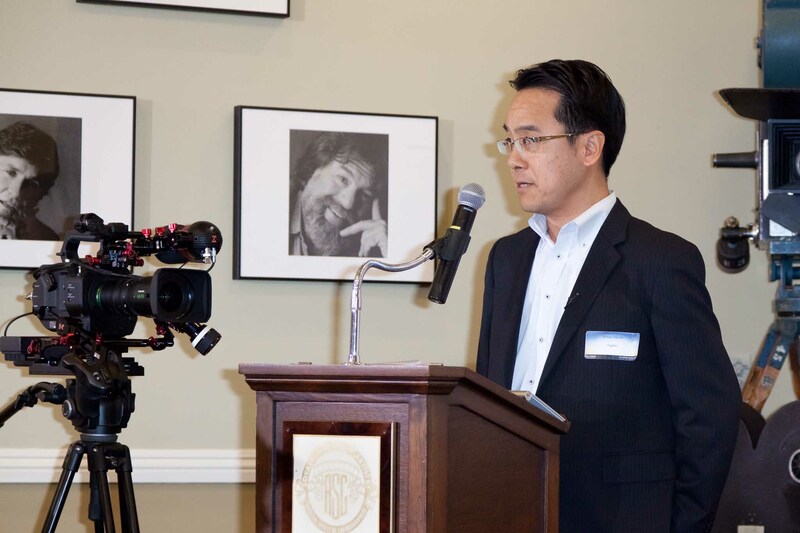 Shingo Harada, President of Fujifilm North America Electronic Imaging and Optical, presenting MK lenses at the ASC in Hollywood. Photo: George Leon. 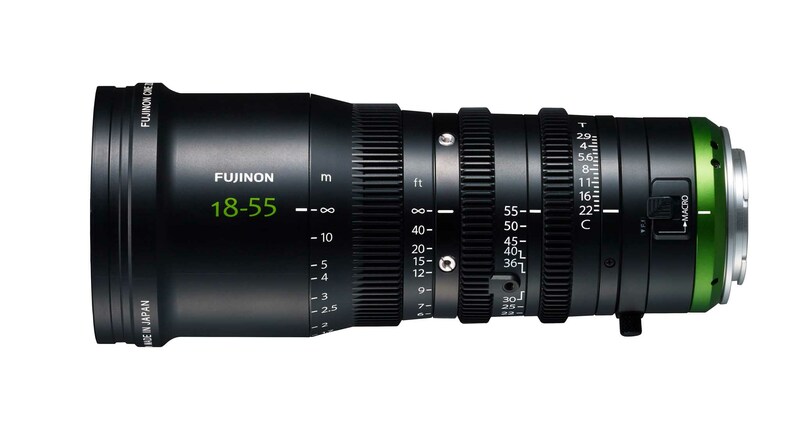 Fujinon’s MK 18-55 T2.9 is an affordable, lightweight, compact, E-mount zoom lens intended for the rapidly growing independent owner-operator market. 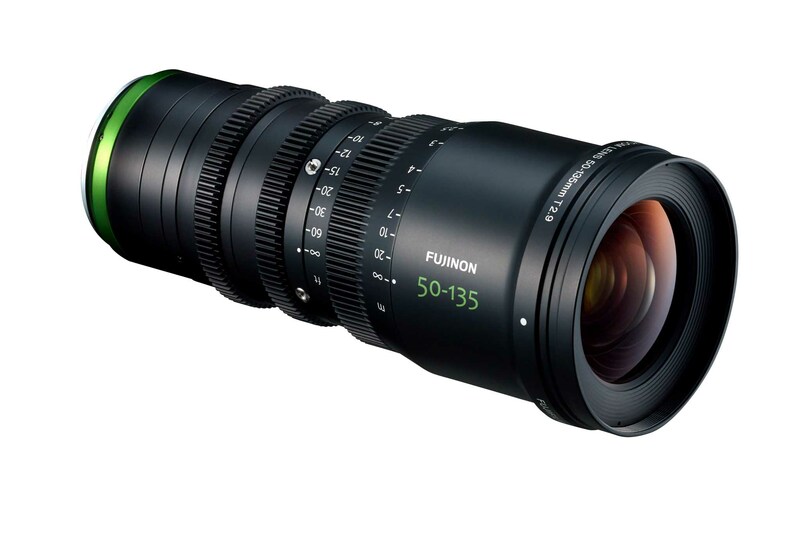 This is a new area for Fujinon, whose HK Premiers are the pinnacle of their 35mm cine zoom line. ZK Cabrios are the handheld compact zoom family members with removable servo handgrips. The XK Cabrio 20-120 is a “slower” but longer PL-mount cine zoom and was Fujinon’s first foray into affordable zoom lenses. 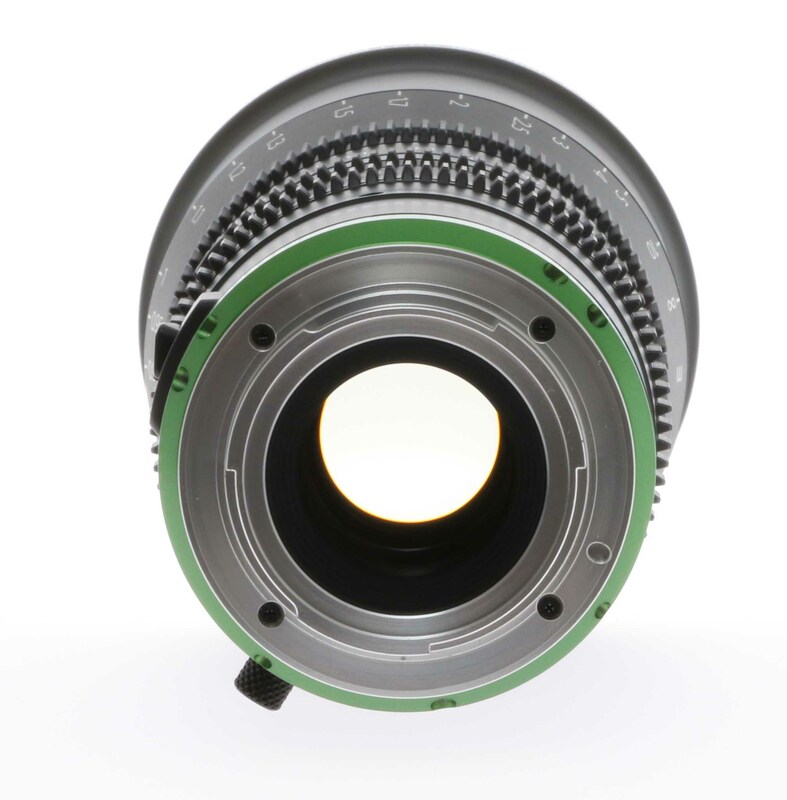 The MK zoom only comes in E-mount (18mm flange focal depth) and represents a growing affirmation of a lens interface that was introduced by Sony. 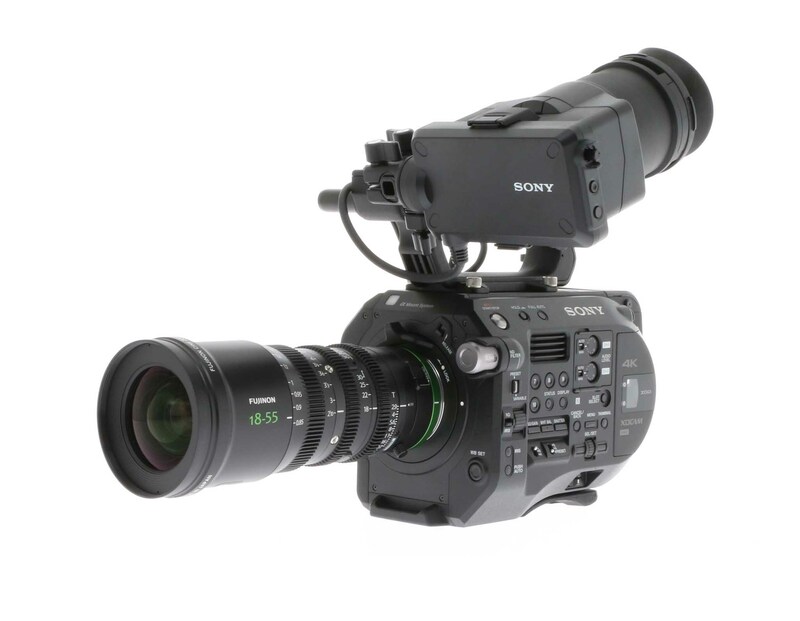 Users can attach the MK 18-55 zoom onto Sony FS5, FS7, FS7 II, FS100, and FS700 cine cameras as well as Sony still cameras like the a7 series and a6500. I expect there will be more to come. The MK focus scale is helpfully marked in both Metric and Imperial. You don’t have to swap focus barrels to go from meters to feet. 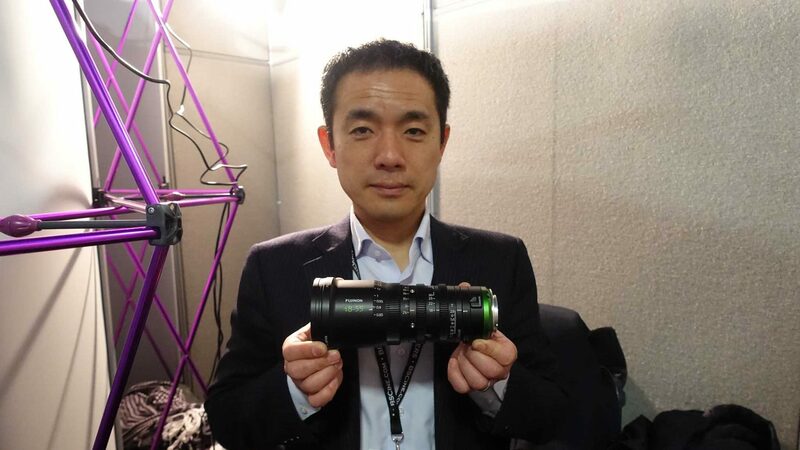 This is a purely mechanical zoom lens. It’s not your father’s ENG lens repurposed for cine. It’s totally opto-mechanical. There are no electronic controls to get in the way. Auto and servo controls are absent. 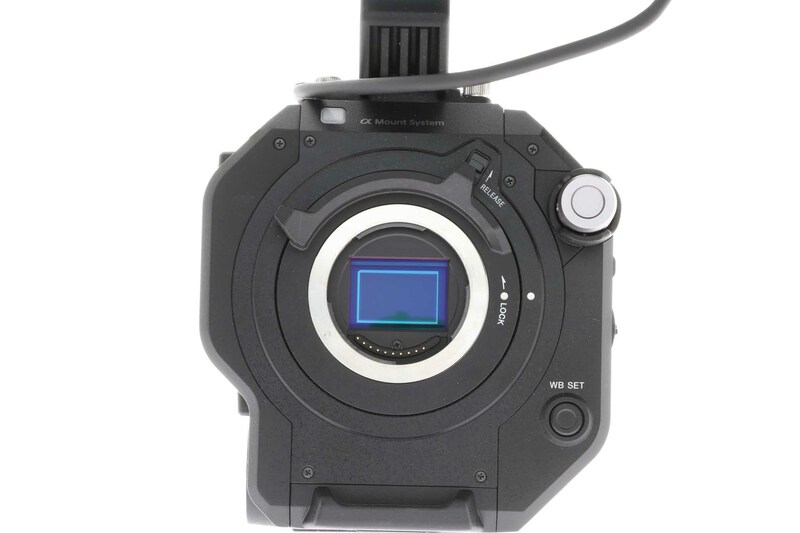 Of course, you can add lens motors to mesh with the industry-standard 0.8M focus, iris and zoom gears for wireless control and I’m sure someone will come up with aftermarket handgrip controls. But meanwhile, this is a quintessential, archetypal documentary style zoom lens. It reminds me of classic 16mm documentary cine zooms and is about the same size and weight. Lest anyone whine about lack of lens markings on the camera right side, remember that you always solved this in the past with a strip of white tape and a Sharpie Fine Point Marker. The front diameter is a mere 85 mm and has 82mm threads for a front screw-in filter. There’s a Macro button for close focus to 1 ft 2.9 in / 0.38 m. You don’t need shims; a thumbscrew enables flange focal depth adjustment. (Once set, tape the barrel to avoid accidentally moving it.) Accessories include a lens support foot and rectangular lens shade. The MK 18-55 begins shipping in March. As mentioned, it’s the first in a series. The MK 50-135 should ship this July. 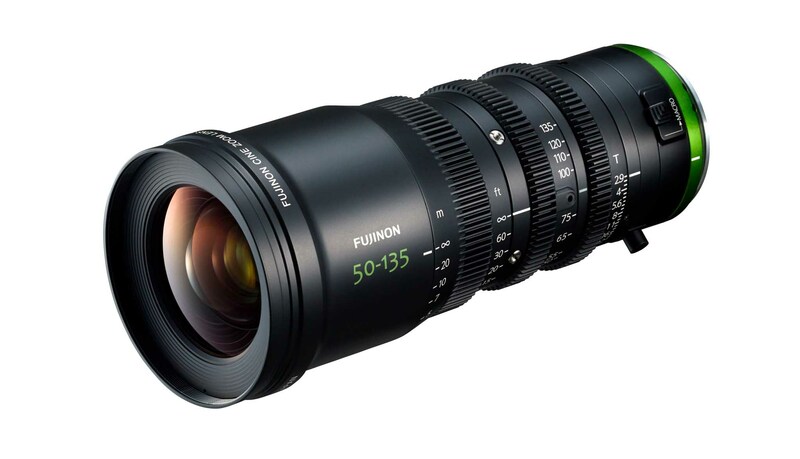 While the 18-55 T2.9 will probably be the go-to lens for handheld, aerials, POV and establishing shots, Fujinon’s MK 50-135 T2.9 takes over for close-ups, portraits, and long lens scenes. Why the need for two lenses when Cabrio 19-90 or 20-120 have greater range? A great deal of thought went into the concept of both MK lenses. Lens design is always a grand bargain—a delicate balance of size, weight, speed, resolution and cost. In this case, to reduce weight and size, yet keep a fast maximum aperture of T2.9 for both lenses, it would not have been practical to attempt all these things in one lens. Why only E-mount? 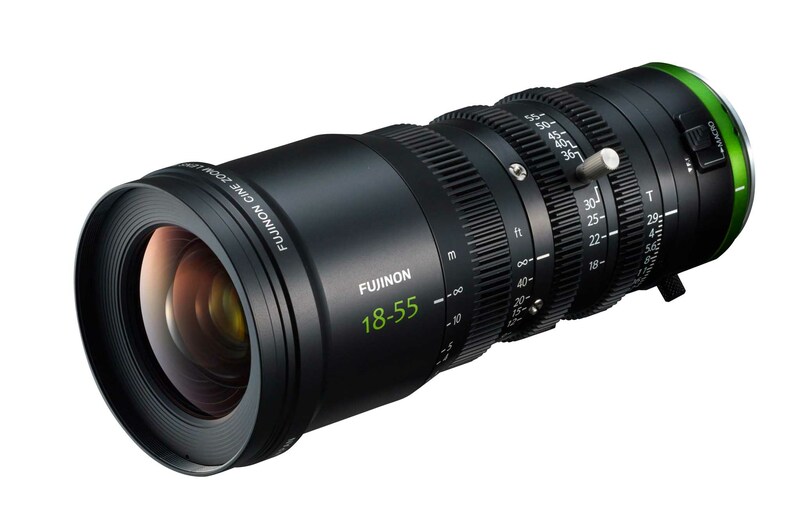 Fujinon optical designers said that the short, 18 mm flange focal depth facilitated the lighter, smaller, faster design. I can hear my phone ringing as rival optical designers call to refute this—nevertheless, the MK lenses are indeed some of the faster-lighter-smaller-sharper zooms out there. 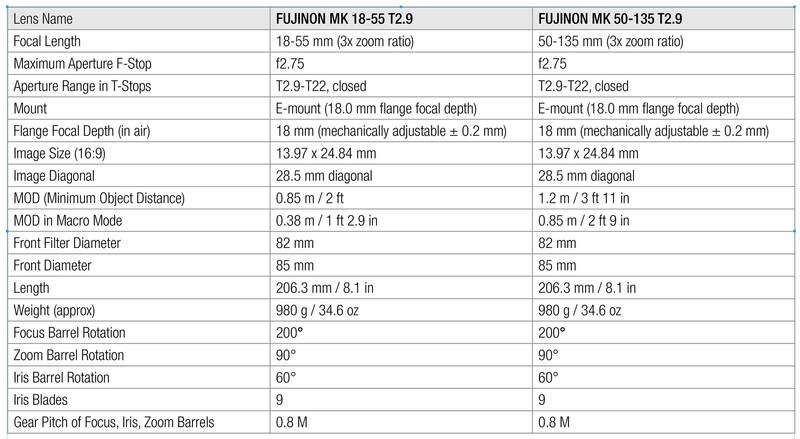 X Mount versions of the 18-55 mm and 50-135 mm MK zooms for the Fujifilm X Series digital cameras with APS-C sensors are being developed and should be seen by the end of this year. Information about the X Mount lenses will be provided as soon as more details are confirmed, but it’s in Fujifilm’s roadmap online. A few days of tests showed excellent optical quality, lack of distortion or aberrations, and splendid resolution with the Sony FS7 II. Focus, iris and zoom barrels on both MK lenses line up—so there’s no need to move lens motors or follow focus position when swapping from 18-55 to 50-135. The front diameter of both lenses is the same—85 mm. Even though the lens barrels are quite skinny, they have a traditionally long degree of rotation. Focus rotation is a generous 200°. Zoom is 90° and Iris is 60°. The weight of each lens is 2 lb 2 oz (980 g) and length is 8.1 in (206.3 mm). Image coverage is 28.5 mm diagonal, which in Super35 16:9 format is 13.97 x 24.84 mm. There are 9 iris blades providing an aperture range of T2.9 – T22, with a completely closed position as well. Price is around $3,799 for the MK 18-55. At the ASC Hollywood Introduction, l-r: Miles Shozuya, Shahour Nosrati, Tom Fletcher, Josh Ewing, Jaclynne Gentry, Chuck Lee. Photo: George Leon. Finally! Great options for e-Mount! Bring it!